The only similarity between Thudguard and the traditional cycle helmet is the outlining shape. There have been many different attempts at safety hat design but the most popular has always been the full head protection form. With this in mind, Thudguard began with this traditional and accepted appearance. Thudguard is for babies and toddlers who are learning to walk in a world of hard surfaces and protects by acting as a cushion between the baby's head and danger, usually when they fall over. The cycle helmet is hard, heavier and would not be suitable for this. Thudguard is made from incredibly advanced lightweight foam that gives maximum impact protection around a baby's head in the early years when the fontanelle or soft spot, can be vulnerable. Thudguard is not a hard helmet and it won't slide around; shifting weight and adding danger like hard, heavy helmets. 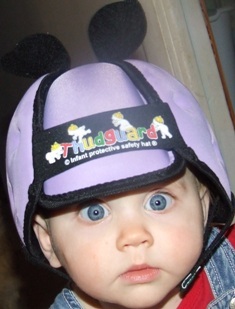 Thudguard eliminates the weight and discomfort of leather, plastic and vinyl-covered latex headgear, and all the reasons why children refuse to wear protective headgear. I and many of my friends with small children rest easy knowing we are assured of the safety for our baby's heads. I believe that each and every family should use this product for the sake of their children's future.